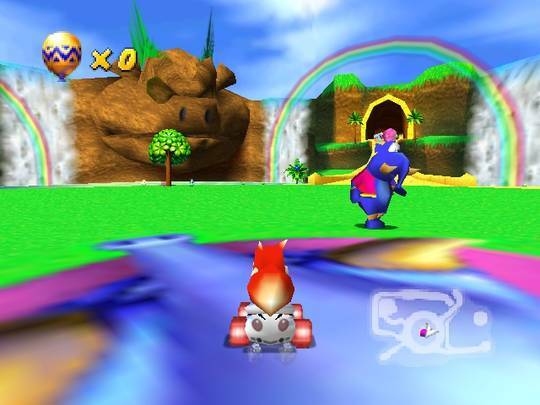 Diddy Kong Racing is a kart-racer that was remade for the Nintendo DS in 2007. There's ten playable characters and your mission is to defeat Wizpig and his henchmen to take back control of Timber Island. It consists of five worlds (with 4-5 races each) and the available vehicles are a car, hovercraft and plane. Five different items can be found during races (missiles, shields, speed boosts, defensive items, and magnets that pull you closer to the nearest opponent) which become more powerful with each consecutive pick-up. The gameplay is highly innovative with a novel open world to explore at your leisure. Even the game's opening cleverly forces you to hunt by purposely leaving you one balloon short of progressing to the next area; by switching to a plane or a hovercraft and searching the surrounding area you'll find hidden balloons... a great way to keep you engaged and invested in the game's free-roaming nature. On top of this, the vehicle variety gives the adventure greater depth and exceeds many other racers of the day. Likewise, the stackable weapon power-up mechanic is inspired, as it rewards patient players instead of those who hastily use their latest pick-up. The excellent Silver Coin Challenges task you with placing first and locating all eight coins; this gives you a whole new way to explore each course and it's somewhat reminiscent of Sonic R (1997, Sega Saturn), only much more fun due to the tightly structured stage design. While the action is certainly playable, the choppy frame-rate is where the game has aged the most and it can result in over-steering. The bosses are a fantastic addition to mix things up though, despite their bizarre and out-of-place voiceovers! Diddy Kong Racing is a must-play game thanks to its inviting open world, superb vehicle assortment, and interesting Silver Coin / boss challenges. It's way ahead of its time in the kart-racing genre, and despite a few frame-rate issues it still holds up remarkably well today. Random trivia: The game code contains a ton of unused assets which you can explore here.